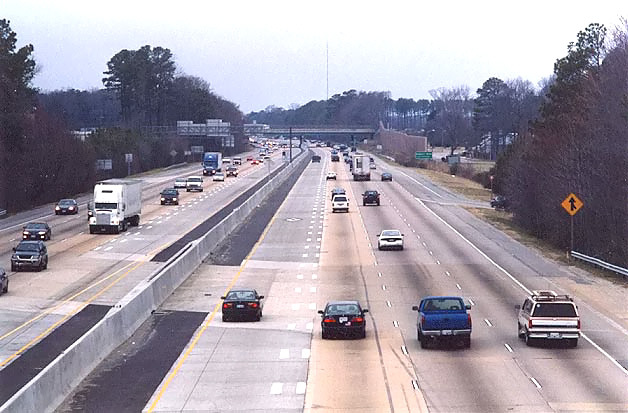 Eight-lane widening with HOV lanes, was completed in July 2006, on the 10.7 miles of I-64 from 0.5 mile west of Bland Boulevard in Newport News, to the I-664 westerly ramps with I-64 in Hampton. There were earlier I-64 widening projects to the east of the current projects, to the Hampton Roads Bridge-Tunnel (HRBT), and future I-64 widening projects are planned to the west of the current projects, to Richmond. The I-64 highway and these projects are administered by the Virginia Department of Transportation (VDOT). The four widening projects on the 10.7 mile segment of I-64 described above, have been completed to eight lanes, with the easternmost project completed in July 2006. 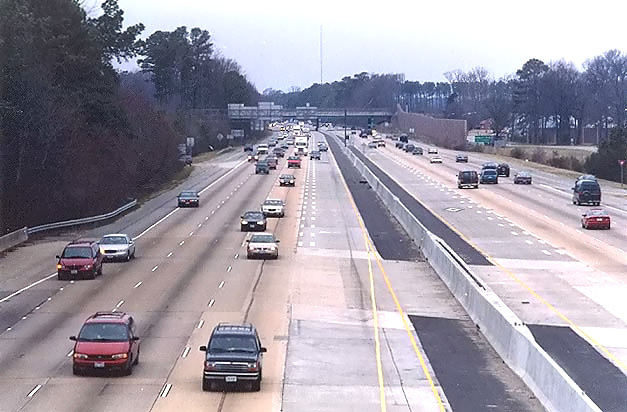 In December 2001, two new HOV-2 lanes, one eastbound and one westbound, opened on the 7.6-mile-long section of I-64 between near the Bland Boulevard overpass and Hampton Roads Center Parkway, thus adding new 7th and 8th lanes to the new 5th and 6th lanes that were opened earlier in 2001. By July 2006, the HOV lanes were extended to I-664. The inside lane each way on this 10.7 miles of I-64 are concurrent flow HOV (High Occupancy Vehicle) lanes that are HOV-2 during peak morning and evening weekday hours. So three lanes each way are general purpose lanes open to all motor vehicle traffic at all times, and the inside lane each way is HOV-2 (each vehicle must have at least two people) during peak periods and is open to all traffic during non-peak times. The final 2.5-mile-long I-64 widening project between Hampton Roads Center Parkway and I-664, the Coliseum Central Project, was placed under construction in June 2001 and was completed in July 2006, and it included major expansion to the US-258 Mercury Boulevard interchange, and it added one lane each way to the I-64 highway which was formerly three lanes each way, and the new lanes are on the inside of each roadway and have the same HOV-2 peak period restrictions as described above. Actually, including auxiliary lanes added on the right of each I-64 roadway, the I-64 highway has 10 lanes (5 each way) between Hampton Roads Center Parkway and VA-134 Magruder Boulevard, 12 lanes (6 each way) between Magruder Boulevard and US-258 Mercury Boulevard, and 10 lanes (5 each way) between Mercury Boulevard and I-664. I-64 is a very wide highway in that segment. All four of these projects include full 10-foot paved emergency shoulders on the right and left sides of each roadway. 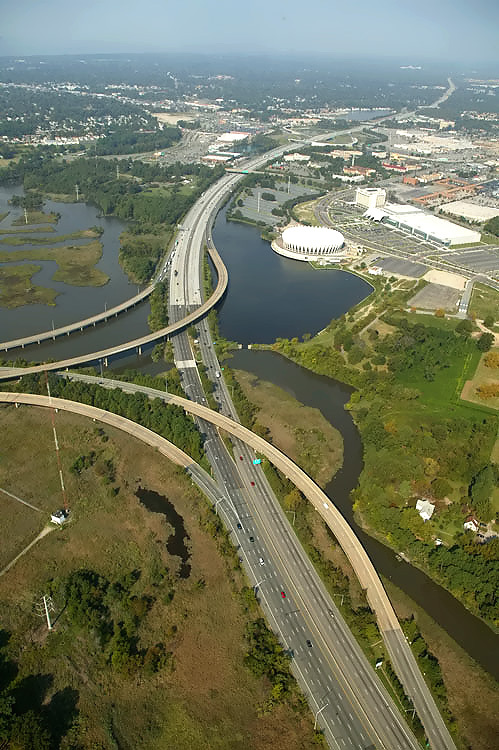 I-64 in Newport News and Hampton was originally completed in sections, from 1957 to 1965, as a 4-lane freeway. The 6.5-mile-long section of I-64 in Hampton from just west of VA-134 Magruder Boulevard, to VA-143 Mallory Street (just west of the HRBT) was widened from four lanes to six lanes, built in sections from 1979 to 1988. The I-64/I-664 interchange and 1.2 miles of I-664 in Hampton was completed and opened in 1981, and the first widening project on I-64 of one mile in the I-664 interchange area was part of that project. 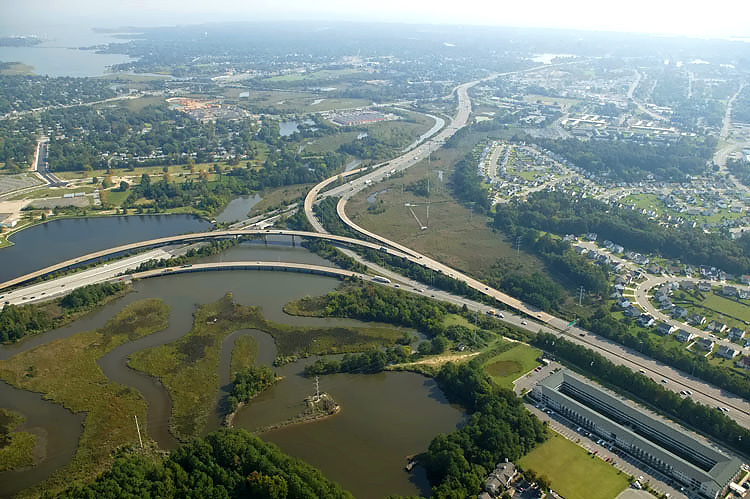 The 4.0-mile-long I-64 section from 0.3 mile east of US-17 J Clyde Morris Boulevard, to 0.4 mile east of Hampton Roads Center Parkway (HRCP), was widened from four lanes to six lanes in two projects. 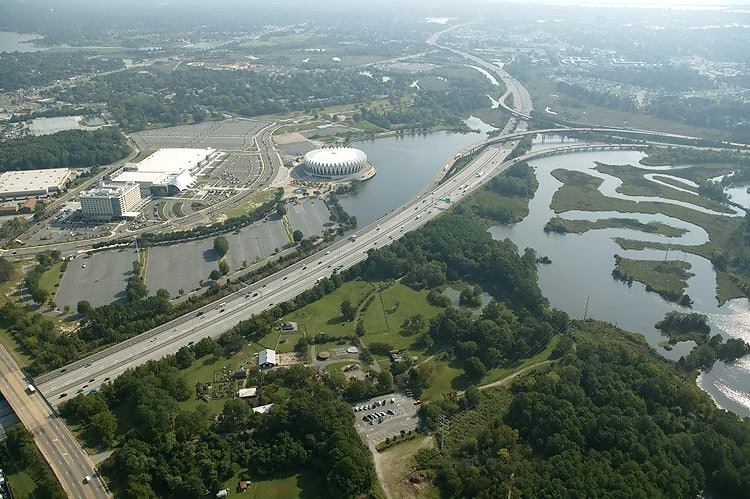 The 2.0 miles from west of Hampton Roads Center Parkway to Magruder Boulevard was completed in 1990; and the 2.0 miles from east of US-17 to mile west of HRCP was completed in 1995. On the 10.7 miles of I-64 from Bland Boulevard to I-664 -- the current 8 lane widening program was conceived in mid-1980s. The widened highway has three general purpose lanes each way, and a fourth inner lane each way for High Occupancy Vehicles (HOV-2) during peak hours and open to all vehicles during non-peak hours. On the 10.7-mile widening program -- 8-laning was completed on 7.6-mile-long section of I-64 from 0.5 mile west of Bland Boulevard overpass, to 0.4 mile east of Hampton Roads Center Parkway, on December 17, 2001, at a cost of $102.8 million. On the 10.7-mile widening program -- The final 2.5-mile-long I-64 widening project from Hampton Roads Center Parkway to I-664, the Coliseum Central Project, was completed in July 2006, at a construction cost of $106.4 million. As of July 2006, the 10.7 mile I-64 widening program is completed, at a total cost of $283.2 million, for the whole program for engineering, right-of-way and construction. A new I-64 interchange is being planned at Bland Boulevard near the Williamsburg - Newport News International Airport. The cost is estimated at $70 to $80 million for engineering, right-of-way and construction, but the construction is not scheduled in the FY2005-06 VDOT Six Year Improvement Program. Preliminary engineering is underway for 6- and 8-lane widening on I-64 west of the current Newport News projects, all the way to VA-156 Airport Drive in the Richmond area (I-64 is currently 6 lanes between I-95 in downtown Richmond and VA-156). The current tentative plan is to widen I-64 to 8 lanes, from the current western limit of 8-lane widening near the Bland Boulevard overpass area, to VA-199 east of Williamsburg; to widen I-64 to 6 lanes between VA-199 and VA-249 at Bottoms Bridge in New Kent County, to widen I-64 to 8 lanes between VA-249 and I-295, and to widen I-64 to 6 lanes between I-295 and VA-156 Airport Drive. Construction is not scheduled on any of these projects in the FY2005-06 VDOT Six Year Improvement Program. The following 3 photos were taken by Roads to the Future in early March 2002. I-64 in Hampton, looking westward from the Hampton Roads Center Parkway (HRCP) overpass. The lane that was added, is the HOV inside lane each way, and it is 16 feet wide to allow for the 4-foot double-line separator between that lane and the adjacent lane. The rest of the lanes are 12 feet wide, the standard lane width for Interstate highways. I-64 in Hampton, looking westward from the Hampton Roads Center Parkway overpass. Similar vantage point as previous photo, taken a few minutes later on the same day, but about 50 feet to the left. On the eastbound roadway, the HOV inner lane temporarily ended in the foreground of the photo; the HOV widening project from there to I-664 is under construction (and was completed in July 2006 with all lanes opened). I-64 in Hampton, looking eastward from the Hampton Roads Center Parkway overpass. The previously constructed project ended up ahead where you can see the concrete inner lanes ending, and the Coliseum Central Project then under construction can be seen starting at that point and proceeding eastward. The partially demolished Magruder Boulevard overpass can be seen in the distance; the widening necessitated the complete replacement of that bridge, and a construction detour utilized westbound HRCP and eastbound I-64. Photo taken about 10 minutes after the previous two photos. It was a color photo, but it was dark enough that the HP ScanJet 5300 translated it into black-and-white. The following 16 photos were taken on September 28, 2006, by the Virginia Department of Transportation, and are posted here with their permission. Roads to the Future utilized PhotoDeluxe Business Edition to sharpen and brighten and to align all of the photos. Click on the photo to get a large version of the photo. In later versions of Netscape and Internet Explorer, you probably will need to use Full Screen mode (the F11 key can be utilized to swap back and forth between Full Screen and Regular) to see the full size of the large photo without browser-induced image shrinkage. The large photos have sizes ranging from 156 to 230 kilobytes, with most of them being under 181 kilobytes. With a broadband or network Internet connection each photo will download within seconds, but with a dial-up Internet connection it will be somewhat slower. Reconstructed interchange of I-64 and US-258 Mercury Boulevard in Hampton, looking eastward. Mercury Boulevard runs bottom to top, and is a 6- to 8-lane arterial. I-64 runs left to right, and is 10 to 12 lanes wide between I-664 and Magruder Boulevard. The rebuilt interchange has 4 outer ramps, 2 loop ramps, and 2 semi-directional ramps (the original interchange had 4 outer ramps and 4 loop ramps). The semi-directional ramps, also referred to as "flyover ramps", handle the movement from eastbound Mercury Boulevard to westbound I-64, and the movement from eastbound I-64 to eastbound Mercury Boulevard. Traffic volumes at this junction in 2005, averaged about 138,000 vehicles per day on I-64, and about 66,000 vehicles per day on Mercury Boulevard. Peak summer weekend day traffic on I-64 can reach about 170,000 vehicles per day. Reconstructed interchange of I-64 and Mercury Boulevard, looking northeast. Mercury Boulevard runs lower left to upper right, and I-64 runs upper left to lower right. Reconstructed interchange of I-64 and Mercury Boulevard, looking northwest. Mercury Boulevard runs left to right, and I-64 runs bottom to top. Reconstructed interchange of I-64 and Mercury Boulevard, looking west. Mercury Boulevard runs upper left to lower right, and I-64 runs lower left to upper right. Reconstructed interchange of I-64 and US-258 Mercury Boulevard in Hampton, looking west. Mercury Boulevard runs upper left to lower right, and I-64 runs lower left to upper right. Reconstructed interchange of I-64 and Mercury Boulevard, looking west. Mercury Boulevard runs bottom to top, and I-64 runs left to right. 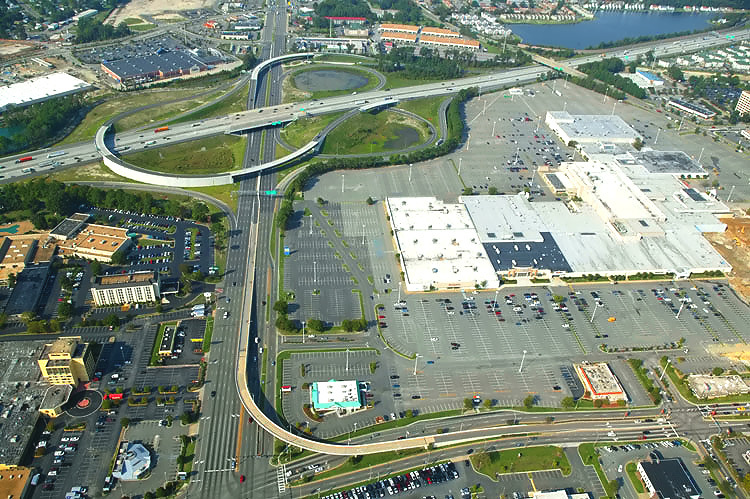 Mercury Boulevard has a flyover ramp into the shopping mall access road, and that ramp was built over 20 years ago. The shopping mall in the right of the photo, is the Coliseum Mall. Reconstructed interchange of I-64 and Mercury Boulevard, looking southwest. Mercury Boulevard runs center left to upper right, and I-64 runs left to right. The shopping mall in the bottom of the photo, is the Coliseum Mall. Cunningham Drive is a 4-lane arterial, and crosses over I-64 in the right of the photo. Reconstructed interchange of I-64 and Mercury Boulevard, looking southeast. Mercury Boulevard runs left to right, and is a 6- to 8-lane arterial. I-64 runs bottom to top, and is 10 to 12 lanes wide between I-664 and Magruder Boulevard. Cunningham Drive is a 4-lane arterial, and crosses over I-64 in the lower part of the photo. I-64 runs lower left to upper center, and I-664 runs to the right. Looking east. Interchange of I-64 and I-664 is in the distance. The Hampton Coliseum is visible in the left of the photo. I-64 runs lower left to upper center, and I-664 runs to the right. Looking east. Interchange of I-64 and I-664 is in the distance. I-64 runs lower left to upper center, and I-664 runs to the right. Looking east. The Hampton Coliseum is visible in the left of the photo. 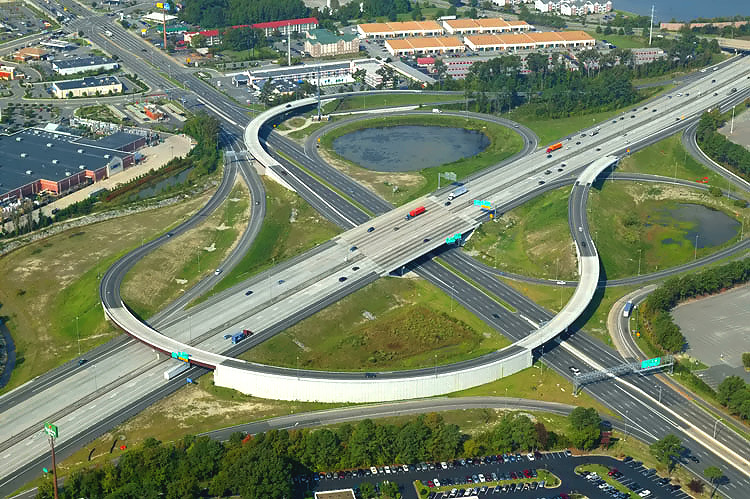 The 3-leg I-64/I-664 interchange is a semi-directional interchange with high-speed 2-lane ramps connecting the two highways. This section of I-64 originally opened in 1957, and the I-64/I-664 interchange and 1.2 miles of I-664 in Hampton was completed and opened to traffic in 1981. 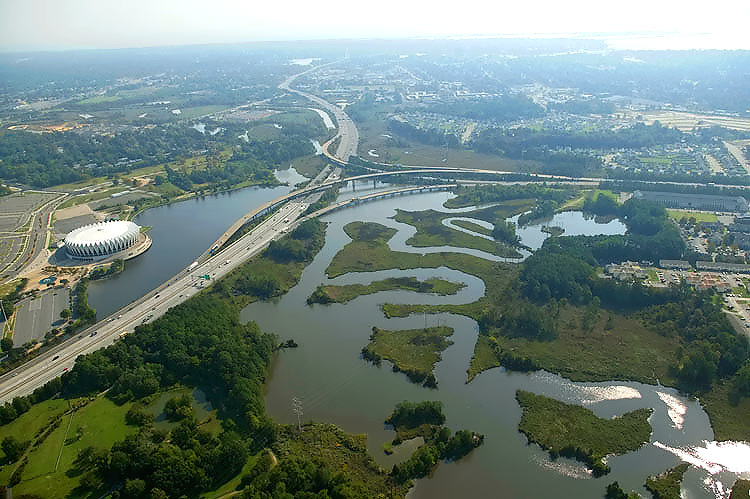 Much of the length of the I-64/I-664 interchange ramps was bridged over water and marshlands, rather than on earthen fill as on the mainline of I-64, due to the higher environmental protection standards that existed subsequent to the National Environmental Protection Act of 1969 (NEPA). I-64 runs center left to upper center, and I-664 runs to the lower right. Looking east. The 3-leg I-64/I-664 interchange is a semi-directional interchange with high-speed 2-lane ramps connecting the two highways. I-64 has 10 lanes (5 each way) between I-664 and Mercury Boulevard, and I-64 has 6 lanes (3 each way) between I-664 and 1/2 mile west of the I-64 Hampton Roads Bridge Tunnel (which has 4 lanes, or 2 each way), and I-664 in Hampton has 6 lanes (3 each way). I-64 runs upper left to lower right, and I-664 runs to the bottom. Looking northwest. The I-64/I-664 interchange is in the foreground. I-64 runs bottom to top, and I-664 runs to the left. Looking west. 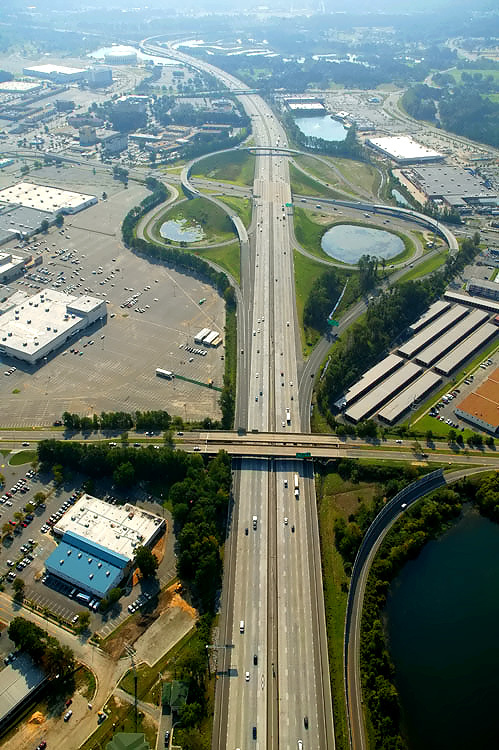 The I-64/I-664 interchange is in the center. I-64 runs bottom to top, and I-664 runs to the left. Looking west. 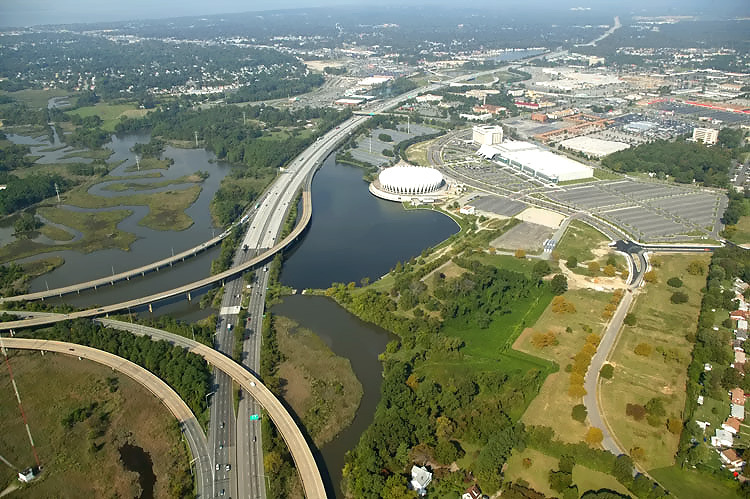 The I-64/I-664 interchange is in the lower left, and Hampton Coliseum is in the center. 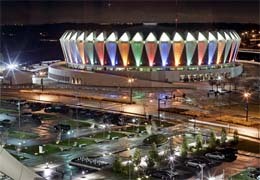 Each Christmas season, the Hampton Coliseum gets bathed in bright festive colors. The Peninsula is the third region in Virginia to get HOV lanes, after Northern Virginia (1969) and South Hampton Roads (1992). The Peninsula HOV lanes are designated as HOV-2 lanes for vehicles carrying two or more people, as well as buses, motorcycles and emergency vehicles. "The Peninsula" is the regional name for the peninsular segment of land between the James River, the York River, and Chesapeake Bay, and it includes the areas of Hampton, Newport News, Williamsburg, York County and part of James City County. 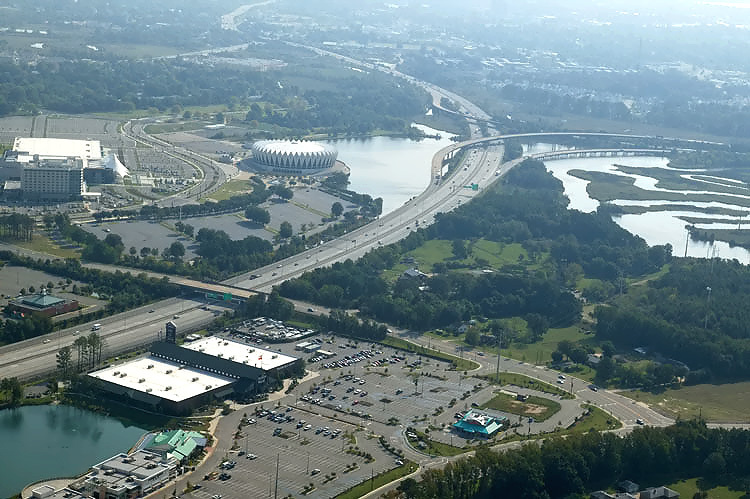 Due to the high directional split of peak traffic, the HOV lanes in Northern Virginia and in South Hampton Roads, operate in a single peak period direction. On the Peninsula, the HOV hours of operation are from 6 a.m. to 8 a.m. and 4 p.m. to 6 p.m. in both directions, Monday through Friday. After analyzing traffic volumes and patterns, VDOT determined that the HOV hours of operation apply in both directions during both peak periods due to the approximately equal distribution of traffic eastbound and westbound. The HOV lanes are open to all motorists during all other hours of the day and on weekends.  Similar to the HOV lanes on I-264 in Norfolk and Virginia Beach, these lanes are not barrier separated, allowing motorists to easily merge on and off the lanes at any time. Nearly seven miles of High Occupancy Vehicle (HOV) lanes along I-64 on the Peninsula are scheduled to open on Monday, December 17. The two new lanes, one eastbound and one westbound, add capacity to I-64. The lanes stretch from an area near the Bland Boulevard overpass/Jefferson Avenue to Hampton Roads Center Parkway. The opening of this segment of lanes marks the first phase in a 22-mile stretch of HOV lanes planned for the Peninsula. A set of I-64 widening projects in Newport News, was completed in December 2001. The total mainline length was 4.2 miles, from 0.5 mile west of Bland Boulevard to 0.3 mile east of US-17 J Clyde Morris Boulevard, and the cost for engineering, right-of-way and construction, was $87.2 million. The existing four-lane (two each way) Interstate highway was widened to eight lanes (four each way), with replacement of existing pavement and existing mainline bridges. The existing interchanges at VA-143 Jefferson Avenue and US-17 J Clyde Morris Boulevard were upgraded. A concrete median barrier was installed. Collector-distributor roadways were added at the VA-143 Jefferson Avenue interchange. One new lane each way was opened in June 2001, making the highway six lanes (three each way). The fourth lane each way opened on December 17, 2001, as an HOV-2 lane. The plan since these projects were conceived in the mid-1980s, had been to widen to eight lanes the 10.7 miles of I-64, from 1/2 mile west of Bland Boulevard in Newport News, to the I-664 interchange in Hampton, with three general purpose lanes each way and a fourth inner lane each way for HOV (High Occupancy Vehicles) during peak hours. In July 2006, the 10.7-mile-long I-64 widening program reached completion, at a total cost of $283.2 million, for the whole program for engineering, right-of-way and construction, which is an average cost of $26.5 million per mile. This includes the aforementioned expansions to five interchanges and all associated work on connecting roads. The funding type was National Highway System / Interstate Maintenance, which is comprised of 90% federal funds from the Federal Highway Administration (FHWA) Highway Trust Fund and 10% state funds from VDOT. As cited in other Roads to the Future articles, freeway HOV lanes not only provide fast travel for car pools and van pools during peak hours, but also provide an open uncongested lane for express bus mass transit. The HOV person occupancy threshold can be increased in the future if the lane at the existing threshold becomes congested, and the time span of HOV operation can be increased if the peak hours expand and begin to congest these lanes during bordering time periods currently outside of the HOV restrictions. Here are images (large and small) of a section of the VDOT 2002 state map where Roads to the Future has shown with a red pen the limits and number of each section as described above, with #1, #2, and #3 and #4 shown. 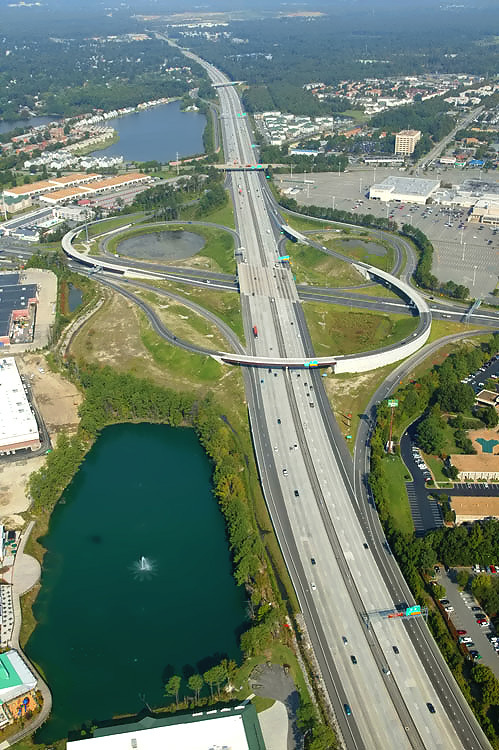 The 4.0-mile-long section from 0.3 mile east of US-17 J Clyde Morris Boulevard to 0.4 mile east of Hampton Roads Center Parkway, was widened from four lanes to six lanes in two projects. 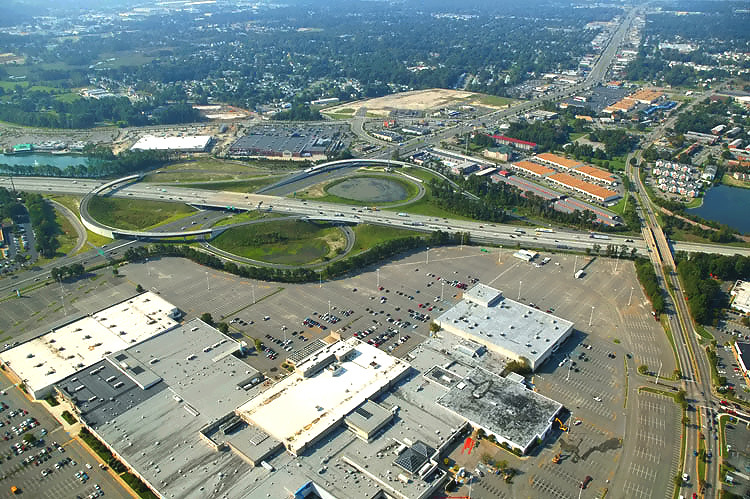 The 2.0 miles from west of Hampton Roads Center Parkway (the HRCP/I-64 interchange was built then) to Magruder Boulevard was completed in 1990; and the 2.0 miles from east of US-17 to west of HRCP was completed in 1995. Since this was part of the 10.7 miles that was planned to be eight-laned since the mid-1980s, Roads to the Future doesn't know why these projects weren't eight-laned -- as mentioned above, that very section was widened from six lanes to eight lanes, with completion in December 2001. It is true that the fourth lane each way would not have been initially usable since the planned eight-lane projects west and east of there had not been started, but the fourth lanes could have been initially striped as closed as was done on the more recent projects west of there. 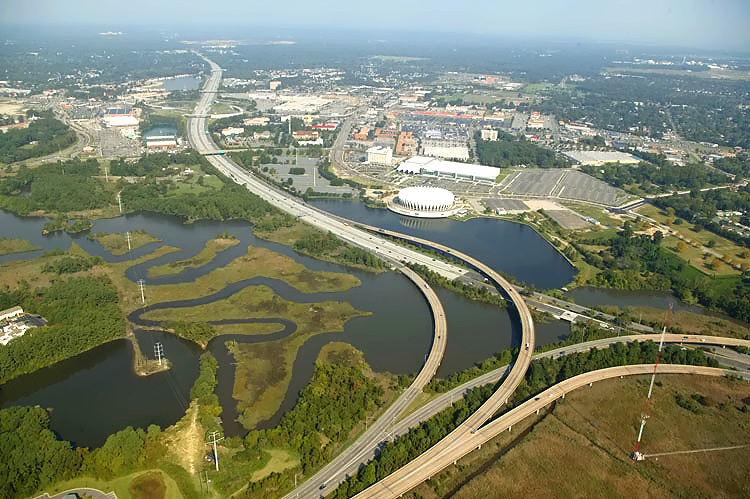 Hampton Roads Center Parkway (HRCP) is a 4-lane limited access highway that extends 5.0 miles from US-17 Jefferson Avenue in Newport News to Armistead Avenue in Hampton. 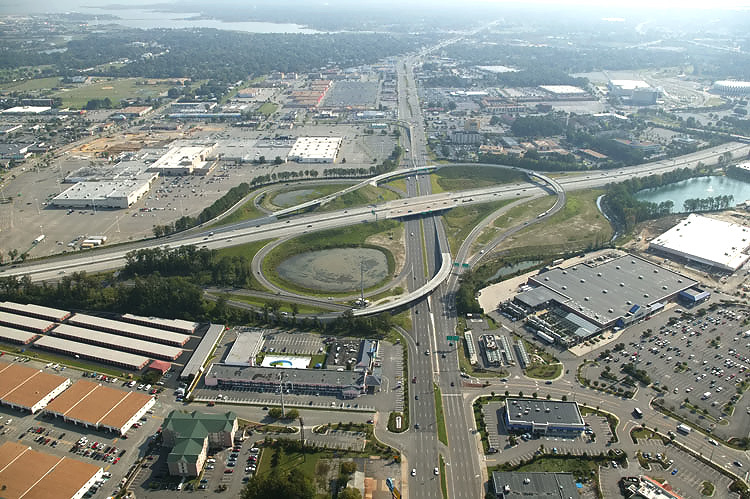 The 2.8 miles of the Hampton Roads Center Parkway from Big Bethel Road to Armistead Avenue was completed when the I-64/HRCP interchange was completed in 1995. The 2.2-mile last section of Hampton Roads Center Parkway was completed in Newport News in January 2003, and it extended the 4-lane parkway westward to US-17 Jefferson Avenue. Actually, a 6-lane widening of one mile of Harpersville Road was utilized to carry the westernmost mile of the parkway to Jefferson Avenue. HRCP has a continuous roadway connection with Harpersville Road. 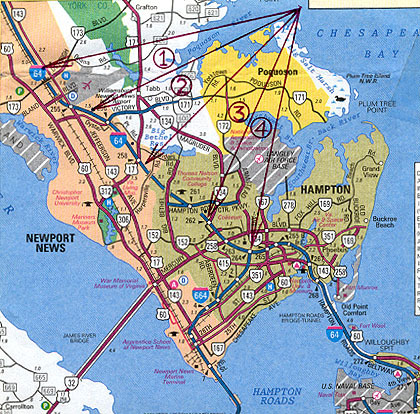 The planning name for the Hampton Roads Center Parkway was the East-West Expressway, with plans to extend it as far west as US-17 Jefferson Avenue and Harpersville Road, and as far east as VA-169 Fox Hill Road in Hampton (the 4-mile-long unbuilt HRCP segment east of Armistead Avenue is not programmed in the FY2005-06 VDOT Six Year Improvement Program, and it faces major environmental obstacles due to wetlands). The 6.5-mile-long section of I-64 in Hampton from just west of Magruder Boulevard to VA-143 Mallory Street (just west of the Hampton Roads Bridge-Tunnel) was widened from four lanes to six lanes much earlier, constructed in sections from 1979 to 1988. This widening included building a parallel 3-lane bridge over the Hampton River for westbound I-64 mainline traffic, rebuilding the pre-existing 4-lane bridges over the Hampton River for 3-lane eastbound I-64 mainline traffic, the realignment and straightening of 1/2 mile of mainline I-64 in the VA-143 Mallory Street interchange area to remove two sharp 45 mph curves, and other interchange improvements. The first of these widening projects was the one mile of I-64 that was widened in conjunction with the construction of the I-664 interchange built 1979-1981. 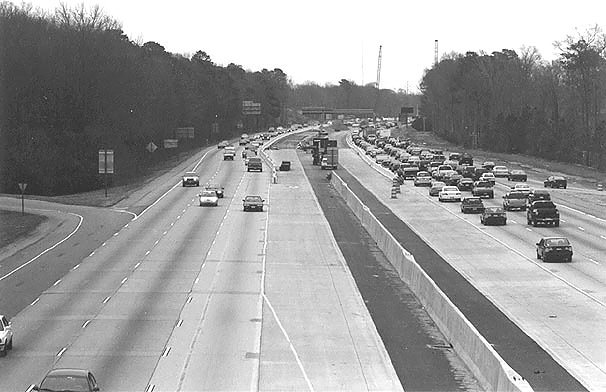 The I-64/I-664 interchange and 1.2 miles of I-664 in Hampton was completed and opened on June 25, 1981, and the first widening project on I-64 of one mile in the I-664 interchange area was part of that project. 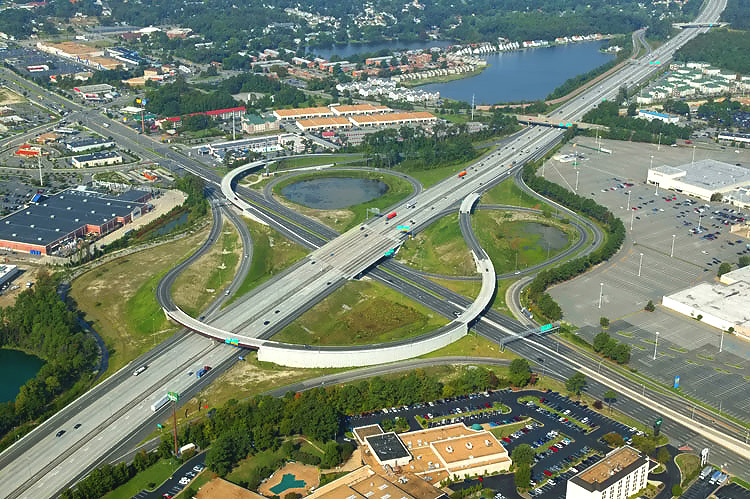 That section of I-664 was also the first segment of I-664 to be built. The last segment of I-64 to be widened in this program was at the Hampton River, which was completed in 1988. The existing traffic volumes on I-64 and the volumes projected on I-64 due the ultimate completion of I-664, were the reason for the widening program on the section of I-64 from Magruder Boulevard to VA-143 Mallory Street. The I-64 toll plaza for the HRBT was just east of Mallory Street, and it was removed when the HRBT became toll-free in 1976. 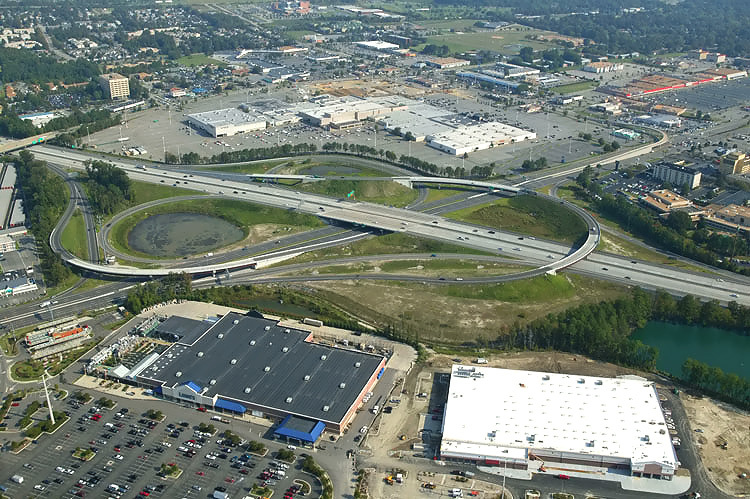 A new I-64 interchange is being planned at Bland Boulevard near the Williamsburg - Newport News International Airport. One of the designs considered is a SPUI (Single Point Urban Interchange). This new interchange and its connecting roads will provide better local access to/from I-64 as well as direct I-64 access to/from the airport, which is seeing continual growth in airline traffic. The cost is estimated at $70 to $80 million for engineering, right-of-way and construction, but the construction is not scheduled in the FY2005-06 VDOT Six Year Improvement Program. Preliminary engineering is underway for widening on I-64 west of the current Newport News projects, all the way to VA-156 Airport Drive in the Richmond area, since this highway has begun experiencing significant peak-period congestion in the last few years, and traffic volumes continue to grow. All of the current I-64 highway on that stretch is four lanes (two each way) and some of the widened sections will be six lanes (three each way) and some will be eight lanes (four each way). The current tentative plan is to widen the I-64 highway to eight lanes (four each way) from the current western limit of eight-lane widening near the Bland Boulevard overpass area in Newport News, to VA-199 Humelsine Parkway east of Williamsburg (the eastern I-64/VA-199 interchange, I-64 Exit 242), with a similar configuration to the recently widened highway, with three general purpose lanes each way and a fourth inner lane each way for HOV-2 during peak hours. No I-64 HOV lanes are planned west of the eastern I-64/VA-199 interchange. The current tentative plan is to widen I-64 to 6 lanes between VA-199 east of Williamsburg, and VA-249 at Bottoms Bridge in New Kent County; to widen I-64 to 8 lanes between VA-249 and I-295 in Henrico County, and to widen I-64 to 6 lanes between I-295 and VA-156 Airport Drive. Construction is not scheduled on any of these projects in the FY2005-06 VDOT Six Year Improvement Program. I-64 is currently 6 lanes between I-95 in downtown Richmond and VA-156. The I-64 traffic volume just east of the I-95 downtown interchange is about 94,000 AADT (annual average daily traffic) with 5% large trucks. Eastward, the volumes decrease, with 58,000 just east of Nine Mile Road, 56,000 just east of VA-156 Airport Drive, and 68,000 just east of I-295. The 38-mile-long section from I-295 to VA-143 Camp Peary Road at Williamsburg varies from 47,000 to 68,000 with 8% large trucks, with the lowest volume being in the area near Norge. 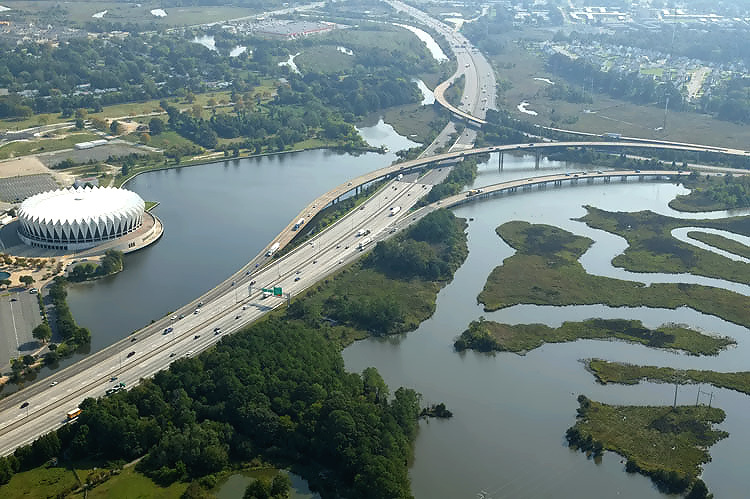 Traffic volumes increase eastward on the 30-mile-long stretch to the HRBT, with 80,000 AADT at the Newport News/James City Co. border, 113,000 just east of VA-143 Jefferson Avenue, 120,000 to 146,000 between US-17 J Clyde Morris Boulevard and I-664, and 91,000 AADT and 4% large trucks across the 3.5-mile-long HRBT. See Roads to the Future article Interstate 64 in Virginia. Traffic volumes from Average Daily Traffic Volumes with Vehicle Classification Data on Interstate, Arterial and Primary Routes , by VDOT, 2005. The first section of I-64 in Virginia to open to traffic was in November 1957 with the 6-mile-long section in Hampton from Magruder Boulevard to the Hampton Roads Bridge-Tunnel (HRBT), and the first 2-lane HRBT opened then too. The 7 miles from Magruder Boulevard to VA-143 Jefferson Avenue in Newport News opened in two sections in 1959 and 1960. The 18-mile-long section from VA-143 Camp Peary Road north of Williamsburg to VA-143 Jefferson Avenue near Williamsburg-Newport News International Airport, opened in 1965. The Major Investment Study (MIS) has been concluded and a Locally Preferred Alternative (LPA) was decided on. The LPA for I-64 included three (3) Lanes and one (1) concurrent High Occupancy Vehicle (HOV) lane in each direction from I-664 to Route 199 near Grove (Exit 242). It also recommended three (3) lanes in each direction from Route 199 (Exit 242) to the New Kent/James City County Line. [...] At this time a feasibility study is underway on an additional interchange at the current Bland Boulevard crossing. A public Information Meeting was held in April 2002. Coliseum Central Highway Project - Interstate I-64 between the I-664 split and the Hampton Roads Center Parkway. High Occupancy Vehicle (HOV) Systems - VDOT webpage for detailed information about the HOV lane systems in Virginia. The webpage has a link to HOV - Hampton Roads: Maps. I-64 Pavement Improvement Project - Road Surface Improvement on the Peninsula. Hampton Roads Transit - Traffix Program - HOV information for the Norfolk/Hampton Roads area. TRAFFIX is a cooperative public service designed to promote transportation alternatives. Its objective is to decrease traffic congestion in Southeastern Virginia by reducing the number of Single Occupancy Vehicles (SOVs) commuting to work sites. TRAFFIX is active on two levels, working with both employers and employees. HOV Lanes with maps of the HOV System. Virginia Department of Transportation (VDOT) , VDOT FY2005-2006 Six-Year Improvement Program, VDOT FY2000-2001 Six-Year Improvement Program, VDOT FY1998-1999 Six-Year Improvement Program, VDOT FY1995-1996 Six-Year Improvement Program, VDOT FY1990-1991 Six-Year Improvement Program. Average Daily Traffic Volumes with Vehicle Classification Data on Interstate, Arterial and Primary Routes, by Virginia Department of Transportation, 2005. Also, VDOT website and Hampton Roads Daily Press. Copyright � 2001-2006 by Scott Kozel. All rights reserved. Reproduction, reuse, or distribution without permission is prohibited.